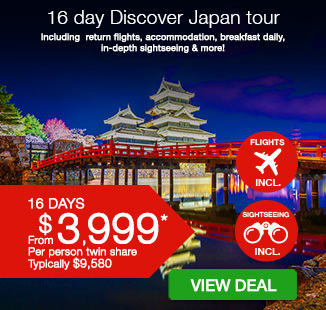 16 day Discover Japan tour with return flights, accommodation, breakfast daily, in-depth sightseeing & more! Cherry Blossom dates available! Must end soon! 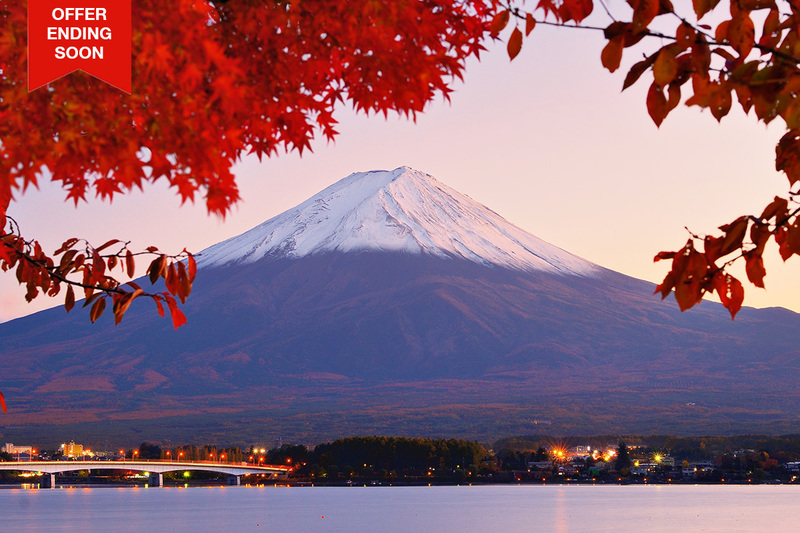 Rich in vibrant colour, history, tradition and beauty, Japan is a spectacular destination for all kinds of travellers. 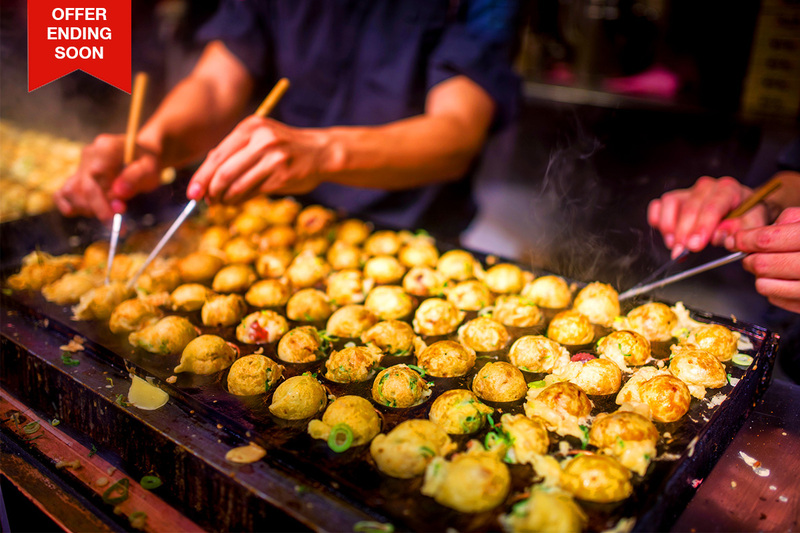 Whether it’s to hike the mesmerising Alps, eat world class cuisine or soak up the cultural bounties, Japan never fails to surprise and delight. It seamlessly combines old and new world to boast magnificent diversity that you can’t help but fall in love with. 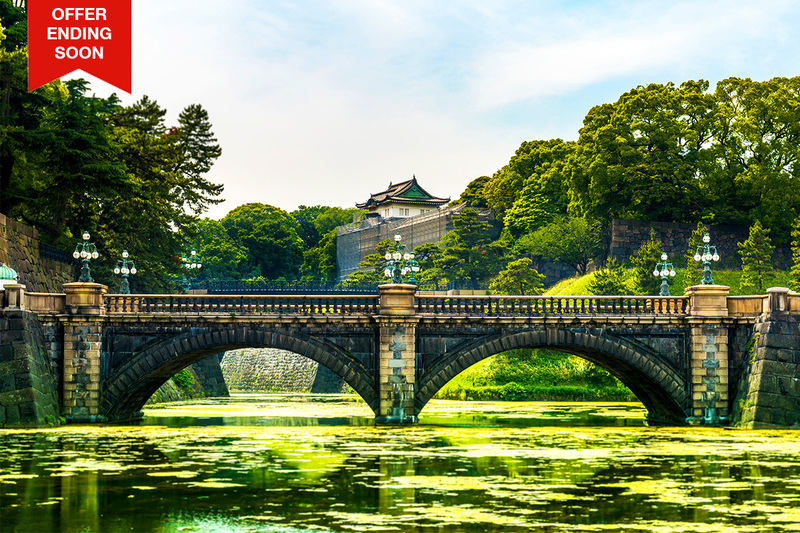 Experience Japan’s very best with this 16 day Discover Japan tour. 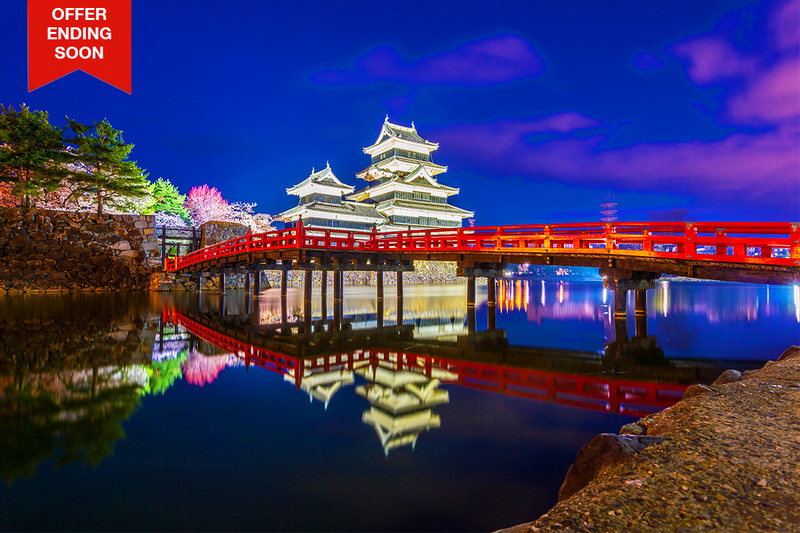 See Tokyo’s incredible nightlife, take a famous bullet train ride, be awed by Mt Fuji and see the nation’s icon, Matsumoto Castle before heading to the crown jewel of Japan, Kyoto! Your package includes return international airfares, accommodation, dedicated tour guides, coach transportation, meals, sightseeing and more. Today we leave Tokyo behind us and travel inland to the cultural city of Matsumoto, famed for it’s castle. For our journey today we board the famous Skinkansen bullet train to Nagano, travelling of speeds upto 320km/h! On arrival in Nagano we will transfer to the city of Matsumoto. You will have time to stroll through the former merchant district of Nakamachi, lined with well preserved old buildings where you can find lovely local crafts, treasures and great restaurants. After we make a visit to Matsumoto Castle, considered in the top 3 feudal castles of Japan and arguably the city’s most famous site. Today we visit some of Takayama’s highlights. We begin our day with the Hida Folk Village, an open air museum exhibiting over 30 traditional houses from the region. After, we continue to the Matsuri-no-mori museum which showcases the key aspects of the Takayama Festival, which takes place for two days each spring and autumn. After learning about the Takayama Festival we head to San-machi Suji. 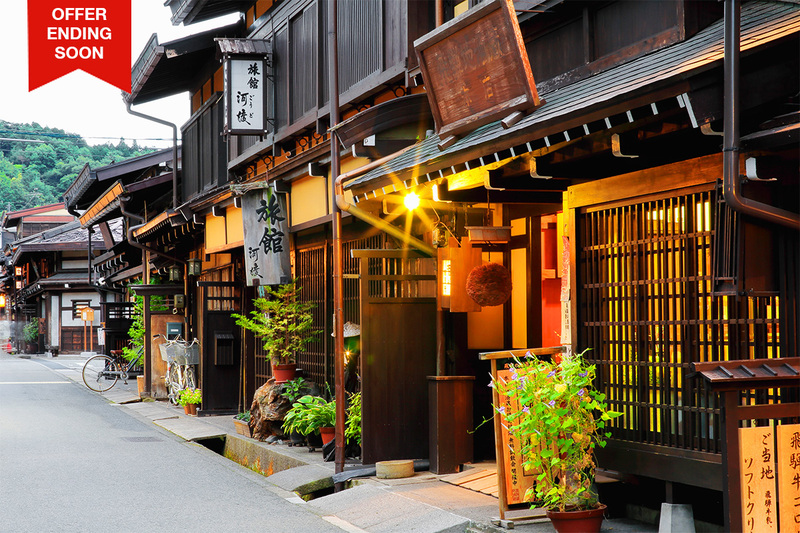 Sanmachi Suji is a collection of three streets that make up Hida Takayama’s famous historic district. The area located in the centre of Hida Takayama served as a bustling merchant town in the past. Today it is easily recognized with its distinctive old wooden architecture and charm, a traditional Japanese village area and Takayama Jinya. A small 3 lane area is filled with old wooden buildings consisting of sake breweries, small boutiques and some larger merchant houses which are now museums. This morning after breakfast we visit the Nishijin Textile Centre and enjoy a traditional kimono show. Kimono’s are still used for important festivals or formal moments in Japan until this day. After, we continue to the UNESCO World Heritage Kiyomizu-dera Temple and drink to your fortune from the streams of the Otowa Waterfall. The water is said to have a different benefit, namely to cause longevity, success at school and a fortunate love life. The Kiyomizu-dera Temple is one of the most celebrated temples of Japan and has spectacular views over Kyoto. After, we continue our journey across Japan travelling to Osaka. 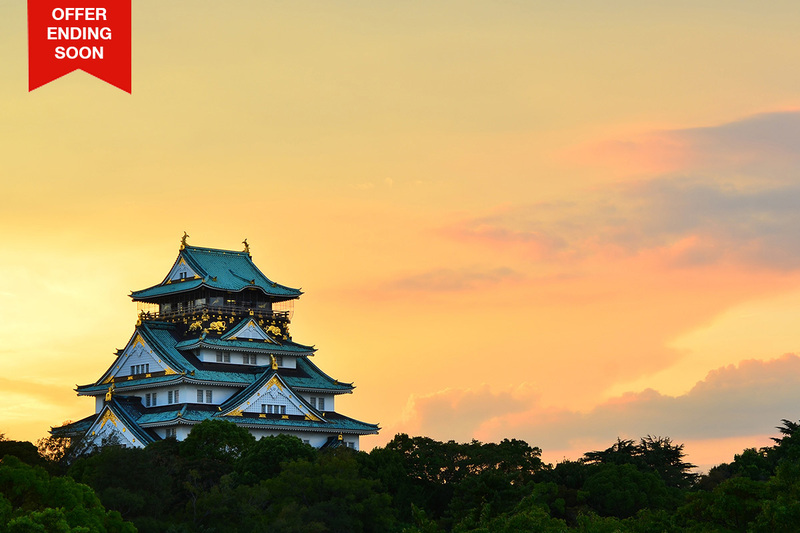 On arrival we get to know this neon powerhouse starting with a visit to Osaka Castle. 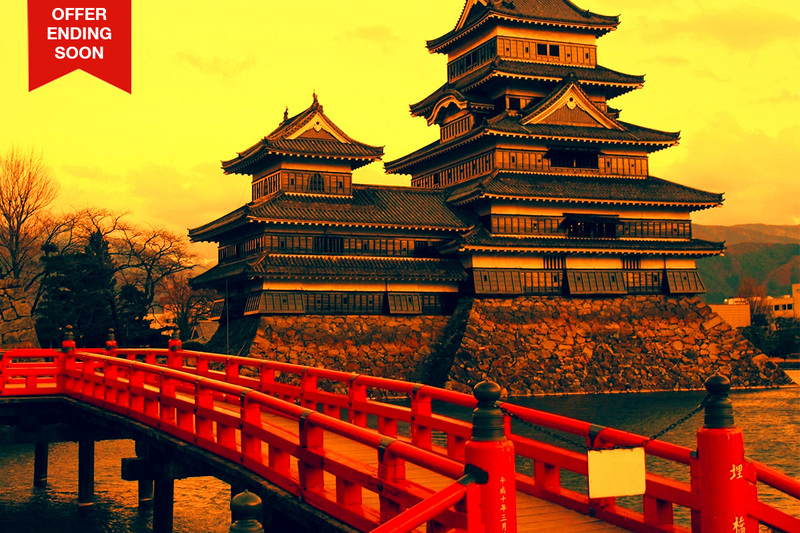 Built in 1583, the castle is an outstanding representation of Japan’s feudal period. After Osaka Castle we continue on to the Floating Garden Observatory for 360 degree views of Osaka. We then make our way to the Shitenno-ji Temple. 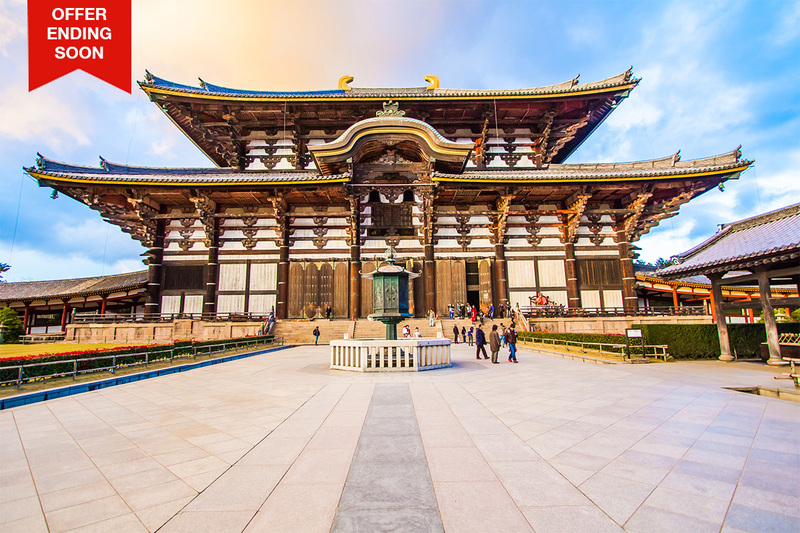 One of Japan’s oldest temples and the first ever to be built by the state. It was founded in 593 by Prince Shotoku, who supported the introduction of Buddhism into Japan. Finally we head to the Namba area which is the city’s most famous entertainment district and offers abundant dining and shopping choices. Optional Tour – Osaka Aquarium—This morning you can visit one of Japan’s most spectacular aquariums. Marine life is displayed in 15 tanks, each representing a specific region of the Pacific Rim. The central tank, representing the Pacifc Ocean, is nine meters deep and home to a whale shark, the aquarium’s main attraction. 13 nights’ twin share accommodation in superior central hotels! Adelaide customers will be flown to either Melbourne or Sydney to meet their international flight on one of the airlines above. A $300 interstate surcharge applies, please purchase the interstate fee from the extras page in addition to your $3999 voucher. We are unable to guarantee which airline you will travel with as flights will be booked subject to promotional fare availability for your travel dates. 16 day tour – $2,499 per person in addition to the twin share price. All optional tours must be pre-purchased prior to departure by clicking here. Transportation is not included for all optional programs. However, the optional programs are located in the CBD which can be accessed easily. 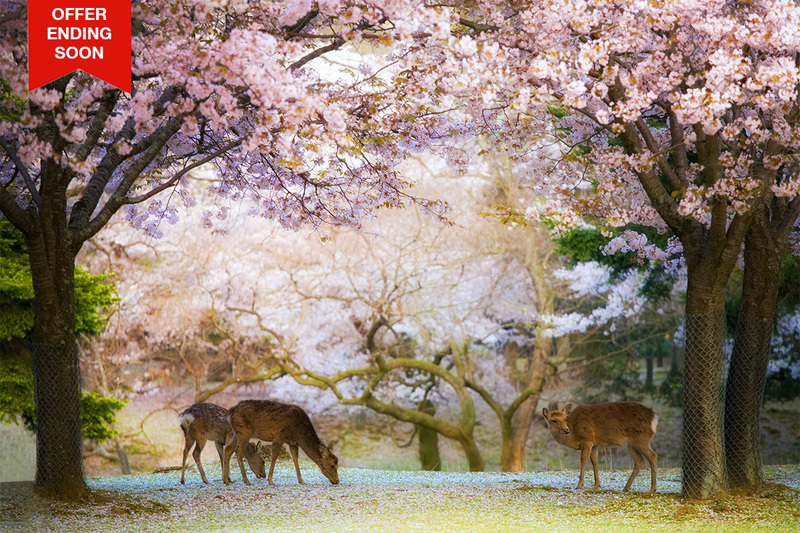 Rich in vibrant colour, history, tradition and beauty, Japan is a spectacular destination for all kinds of travellers. 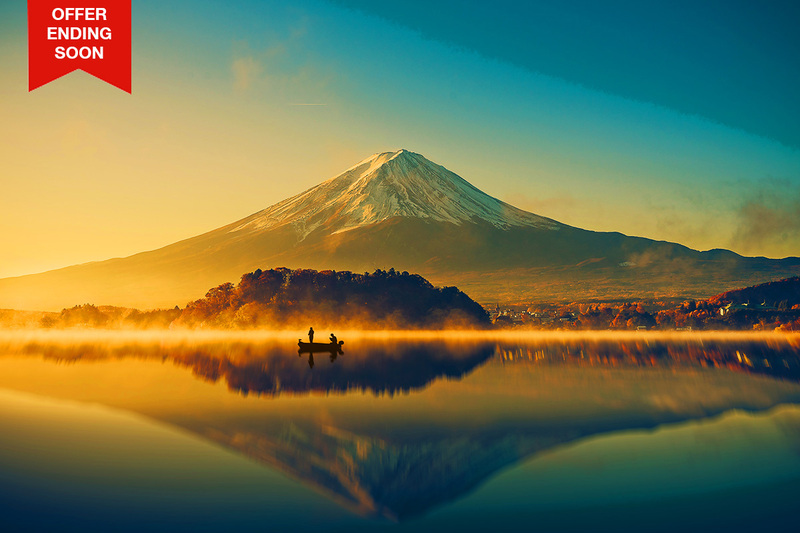 Whether it’s to hike the mesmerising Alps, eat world class cuisine or soak up the cultural bounties, Japan never fails to surprise and delight. It seamlessly combines old and new world to boast magnificent diversity that you can’t help but fall in love with. 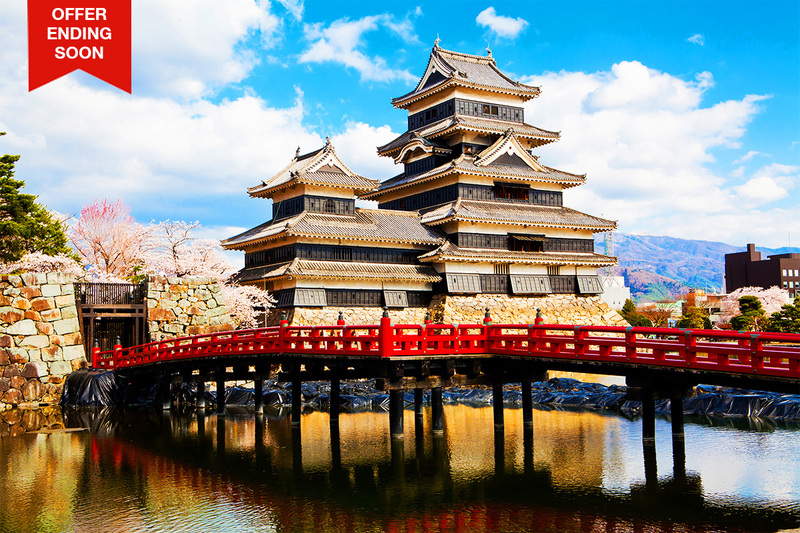 Experience Japan’s very best with this 16 day Discover Japan tour. See Tokyo’s incredible nightlife, take a famous bullet train ride, be awed by Mt Fuji and see the nation’s icon, Matsumoto Castle. Your package includes return international airfares, accommodation, dedicated tour guides, coach transportation, meals, sightseeing and more.